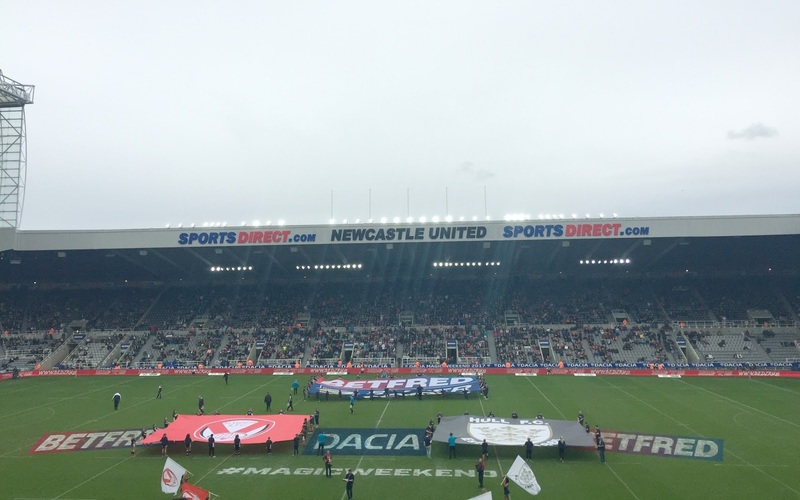 Newcastle has just hosted it's third Dacia Magic weekend and we were lucky enough to be invited along to experience it as a family. The Dacia Magic weekend is a two-day rugby super league event held at Newcastle United St Jame's park stadium, right in the city centre of Newcastle. Three matches are held on each of the days and it is a great way for rugby league fans or total rugby novices like me to experience different matches. Now I openly admit that I have never seen a rugby match before in my life, I am not at all sporty and a day watching rugby is not normally something that I would do. However, I am trying to be more open-minded and try new experiences and as my other half likes rugby I thought I would go along and see what it was like. We were invited as a family to attend the event, however, we ended up leaving the youngest two children at home with their grandma as they were feeling a bit run-down. So myself my other half, teen and dad went along to see what the Dacia Magic Weekend was all about. Arriving at the stadium we were overwhelmed with the crowds outside, everyone was happy and celebrating and there was a real buzz in the air. Every kind of fast food van you could think of was parked up around the stadium, everything from burger vans and pizza vans to gin bars. So many people were dressed up in team shirts and fancy dress costumes and despite lots of rival fans being together everyone was in high spirits and were getting along. We were lucky to have been given brilliant seats in the Milburn stand with VIP access to Heros lounge where we recognised many famous faces. We had comfy leather seats to sit on with a perfect view of the pitch below. We attended the Magic Weekend on Saturday so we watched the matches of Widnes Vikings vs Wakefield Trinity, Hull FC vs St Helen's and Wigan Warriors vs Warrington Wolves. Each match was fast passed and had the crowds on the edge of their seats. The cheers and noise from the crowd was electric when their teams scored. I found the audience to be much more family friendly than a football match and lots of children were in attendance at the matches. In between each match, there were breaks with a live band playing in the corner of the stadium, they also had young rugby fans playing on the pitch and young dance groups performing. The event was really well organised and had a fun-filled, friendly vibe to it. Overall we found it to be a fun way to spend the day, it was something different but we all came away saying that it was a great event that the whole family enjoyed. 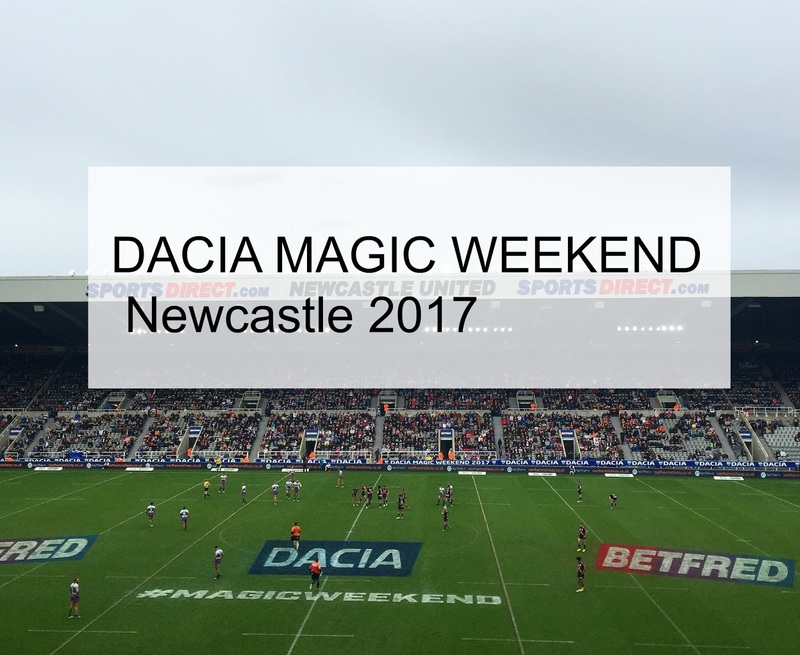 I am not sure if the event will be in Newcastle or if it will be in a different city next year, but if you get the chance to attend the Dacia Magic Weekend - even if you are not a rugby super league fan like myself, you will still have a good time. Disclosure I received complimentary tickets for the purpose of this post, however, all views are my own. Sounds like such a fun weekend - I hope I can make next year!